Without question, delegates attending the B.C. Tourism Industry Conference in three weeks time will have plenty to discuss and, in some cases, vent about considering recent government decisions that directly impact our industry. Some folks may even be in a fighting mood but hopefully the Town Hall will be more productive and civil than contentious. On the positive side...the Province's agreement with Airbnb to collect both PST and MRDT on all short-term vacation rentals is a very progressive step to ensure tax fairness with other accommodation providers. It will also bolster marketing funds for communities/DMOs, as well as compel some homeowners to revert back to much-needed, long-term suite rentals for residents as opposed to short-term vacation rentals. As the regulation and process unfolds, we will learn more about any implications on the MRDT renewal process for communities and whether commercial operators with less than four rooms will be required to contribute. Government also unveiled details on the rollout and timing of its new minimum wage requirements for B.C. businesses. ( news.gov.bc.ca/releases/2017JTST0037-000411) On the positive side...government accepted recommendations by several industry sectors (e.g. restaurants, hotels) to phase in minimum wage over time. Plus, outlining exactly when the increases take place and by how much allows businesses to plan. However, industry remains concerned about the size of the increases (i.e. front-loading) in the first two years, which will hit both businesses and consumers hard. One opportunity remains for government attention; after reaching the minimum wage target businesses are calling for future minimum wage increases to be indexed to CPI as opposed to arbitrarily set. Finally the ongoing dispute over pipelines has found its way into our industry as well. Rightfully, the Province is taking steps to ensure that our pristine coastline is well protected against potential spills, and in the event (heaven forbid) that one should happen, the clean-up process is sufficient to mitigate long-term and/or widespread damage. In retaliation, Alberta's move to ban B.C. wine from its liquor stores, plus the social media campaign to discourage Albertans from visiting B.C. only hurts small businesses on both sides of the Rockies. While I am confident that both governments will sort out their differences, the move to pit friends and family against each other is troubling, especially given how much we rely on each other on so many levels. If these and other issues are of concern to you, I encourage you to attend the TIABC Town Hall to kick of the B.C. Tourism Industry Conference on March 7th. It promises to be an informative, spirited and even entertaining session. Check out complete program details on our conference website ( www.bctourismconference.ca ). 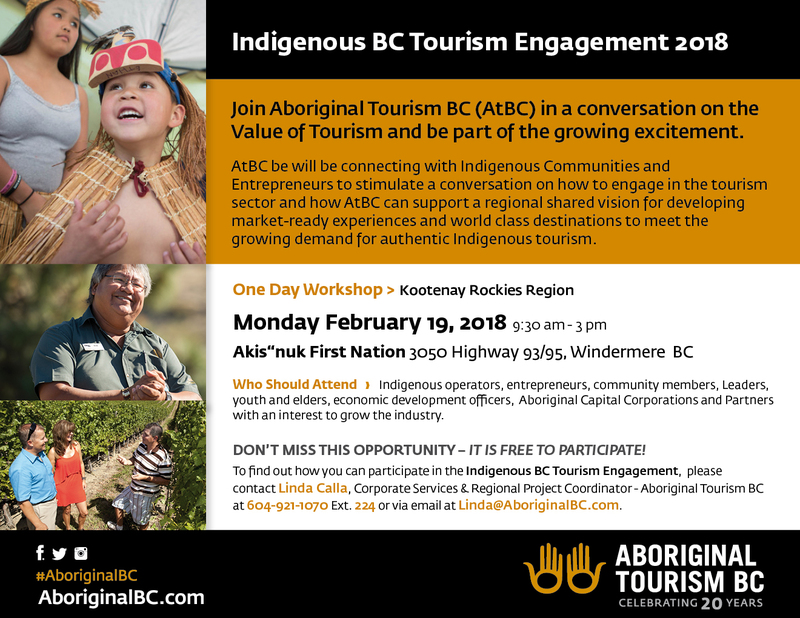 Based on feedback from last year's TIABC Town Hall, we've overhauled the format and content for this year's session to include a higher degree of involvement by delegates that will ultimately benefit all key stakeholders including TIABC, sector associations, DMOs, government and others. Members of TIABC's Board, Policy Committee and various subject matter experts (e.g. sectors) will facilitate individual discussion groups on more than a dozen key topics and issues ranging from short-term vacation rentals and ride-sharing, to labour and liquor policy. Each session will be 20- 25 minutes with delegates participating in up to three subject areas to provide input, ideas and feedback on policies, decisions and priorities for TIABC to tackle and/or for government attention. At the conclusion of the roundtables, all delegates will come together where session leaders will share their findings with the entire audience for further discussion and debate. The 2018 TIABC Town Hall promises to be informative, engaging and beneficial for all delegates. Come prepared to discuss the issues and opportunities that affect your business, sector or community. This family-owned and family-friendly campsite is a 49 acre paradise nestled amongst a luscious forest of mature trees, creeks and streams and features a beautiful private sandy beach on Brannen Lake with a safe swimming area and boat launch. JM Media deliver custom, integrated marketing and advertising solutions. JM Media will implement a promotional mix that fits your needs from our suite of advertising mediums which include digital, social, print, broadcast, community, outdoor and sponsorship opportunities. In an effort to better understand the role and value of the helicopter and snowcat skiing industry in B.C., HeliCat Canada Association commissioned a socio-economic impact assessment of the sector in 2015 with the report released in August 2016. The report showed that the HeliCat industry hosts more than 110,000 skier days each year with 3% average annual growth between 2013 and 2015. The 41 operators in the industry represent more than 10% of the $1.2 billion adventure tourism industry in B.C. B.C. Ferries is embarking on a broad engagement process from now until fall 2018 to gather community input to shape future plans for its Horseshoe Bay terminal. By 2045, Kelowna International Airport (YLW) is anticipated to serve 3.5 million passengers annually. That's more than double the current traffic and with such a high growth rate, they are planning for the future. YLW recently delivered a preliminary design for the future expansion and improvement of the airport terminal building to the Kelowna City Council. The next big expansion of the building will likely come in two years. As business analysts warn some Canadian cities are becoming saturated with craft breweries, beer-makers in northern B.C. see plenty of room to grow by tapping into markets not served by their big-city counterparts. Breweries can also act as a tourist draw. In 2017, the inaugural B.C. Bike Road North tour came to the region offering participants days of mountain biking in northern backwoods, followed by evenings of "unlimited craft beer" from the new local brewers. Big White Ski Resort saw 194cm of snow fall throughout the month of January bringing the alpine snow base at the resort up to 232cm. In B.C. there is a direct relationship between snowfall and the impact on the local economy. In December, Bigwhite.com received an average of 15,157 visits per day, but following days of consecutive snowfall, the website hit 25,734 visits on December 28. The same trend continued in January. With Big White's village elevation of 1,755m, snow typically stays on the ground until spring, which means snow removal services are in high priority at the resort supporting many jobs throughout the winter months. Alberta's government has implemented a ban on all imports of wines from British Columbia. The province's stance follows B.C. 's call last week for further review of the oil-spill risk from the pipeline expansion, a move that Alberta did not welcome. In 2017, Alberta imported about 17.2 million bottles of wine from B.C. amounting to roughly $70 million per year in revenue to B.C. wineries. Approximately 95% of Canadian wine sold in Alberta liquor stores is from British Columbia. On the heels of Alberta's boycott of B.C. wines, the BC government is ramping up its support for the industry by proclaiming April as BC Wine Month, including a special month-long promotion at all public liquor stores. To kick off this initiative an event is being held at Edible Canada on February 22. Farm Friends: Celebrating BC Wine + Alberta Food @ Edible Canada is a public grazing event to unite the community in a show of support for B.C. wineries. The BC Government has committed to developing a broad, more comprehensive Rural Development Strategy. The new strategy will help rural and Indigenous communities build their capacity to create resilient, sustainable futures. Join the online discussion before February 28, 2018 at 4 p.m. and help shape BC's new Rural Development Strategy. Destination Canada is preparing to summarize 2017. On February 20th they will share preliminary end-of-year arrivals information. The numbers are on track to be higher than ever before. In November 2017, Canada welcomed over 1 million international travellers bringing our year-to-date arrivals to almost 19.5 million - just shy of the 19.98 million total arrivals in 2016 and 2002's 20.06 million record. Key highlights for November include Mexico, which continues to see exceptional growth, up 64% over November 2016, and our Asia-Pacific markets which had an impressive 20% growth over November last year including record increases from China, India and South Korea. In early fall, Travel Penticton began working with KVR Middle School to develop an innovate new program that would see Grade 8 pupils become more involved with tourism in the community. The Youth Influencers Program is the brain child of Travel Penticton Executive Director, Thom Tischik. "This program gives us a unique opportunity to directly engage with a younger demographic while allowing the participants to develop essential social media and marketing skills that will be transferable to numerous different job roles in the future," said Tischik. "Tourism is a major contributor to the economic and environmental stability of Penticton. Whether they know it or not, youth has a huge influence in this arena. Often they are the key consideration in deciding where families vacation," he added. Students will complete a series of tourism related projects that will include writing blogs and social media posts, creating videos and designing marketing materials. "Our goals is to encourage students to become Penticton digital influencers and share their ideas and experiences across our social media platforms. More importantly, we hope to encourage pride of community, promote active lifestyle and encourage local environmental stewardship." Some of the Youth Influencer blogs have been posted onto the visitpenticton.com website. HeliCat Canada is the trade organization representing 33 helicopter and snow-cat skiing businesses in Western Canada. The association represents the interests of its members to a variety of stakeholders, sets and promotes the highest possible operating standards through its accreditation program, promotes continual improvement through its focus on research and special projects, and provides a variety of services to its membership. HeliCat Canada is seeking an individual to fill the role of Executive Director. This is a part-time position hired by and directly accountable to the Board of Directors through its elected President. Currently the Executive Director works a 0.55 FTE annual term and has the support of two part-time staff, all located in Revelstoke. The new Executive Director could be located in another community within B.C. Please welcome two new members to the Tourism Kamloops Team. Amy Thompson is their new Senior Marketing + Experience Strategist. Amy's extensive knowledge and expertise in digital marketing is a great addition to Tourism Kamloops. Her previous roles include marketing leadership and support for world-class tourism organizations including Destination BC, Fishing BC, Whistler Blackcomb, Four Seasons Resort Whistler and Lake Louise Mountain Resort. Amy will lead Tourism Kamloops' destination marketing and visitor experience portfolios. Carmen Ruiz, is their Communications + Influencer Specialist, and is supporting the TK team during Lisa White's maternity leave. Carmen is a recent graduate of TRU and has marketing and communications experience from previous work at Sun Peaks Resort and within the community.
" Discover Surrey" officially launched to showcase the new identity, brand message and direction for tourism marketing in Surrey. The development and launch of Discover Surrey positions Surrey as a key competitor in Metro Vancouver and delivers a compelling promotional message for the city in its target markets. The rebranding strategy includes the launch of three new websites, seven videos (to be rolled out throughout 2017/2018), updated activities guide and the name change from Tourism Surrey to Discover Surrey. The new online assets include the platform sites, Golf Surrey , True Surrey and their parent website, Discover Surrey . The recently released footage "Your Story Starts Here"
is the brand video that captures the spirit of the entire city of Surrey and its proud residents. Additional video assets will showcase each of the six distinctly different neighbourhoods within the city: South Surrey, Cloverdale, Newton, North Surrey (including City Centre), Guildford and Fleetwood.